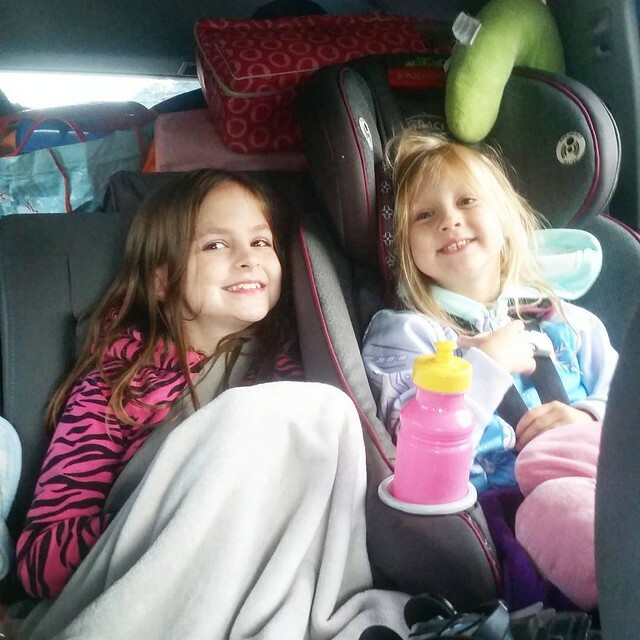 A few weeks ago, we packed our four kids into our SUV along with what seemed like all of our belongings, and we headed to the beach! When you have kids, nothing really goes exactly as planned. Although the drive home was quick, we hit a lot of traffic on the way TO the beach. Our 7 1/2 hour drive turned into an over 10 hour drive. Thankfully, our kids are really good travelers and I was prepared! 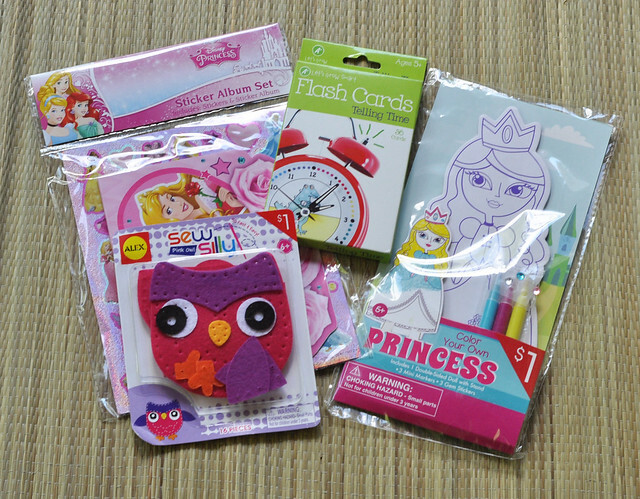 Prior to leaving, I shopped the Target Dollar Spot and put together a few activity kits to keep the kids busy. It didn't cost much money, it was easy to do, and everything can be reused! Before we left, I put a blanket, a pillow, and a pair of socks in each seat in the car. The kids are a lot like me, and I knew they would be freezing when my husband blasted the AC! Plus, I wanted to encourage as much sleeping as possible! I picked up 4 divided trays and cups from the Target Dollar Spot. We didn't want to stop for lunch, so we needed lunch on the go. Each kid got a sandwich, a handful of chocolate chips, and chips (puffs and yogurt melts for Liam) in their tray. I just filled the cups with water so they could be easily refilled. In addition to their lunch kits, we had a big bag of snacks behind the driver's seat and a cooler full of drinks behind the passenger's seat. We were set for the drive to and from the beach, and nobody went hungry or thirsty! My motto is always be prepared for anything, and I have the stocked car to prove it! 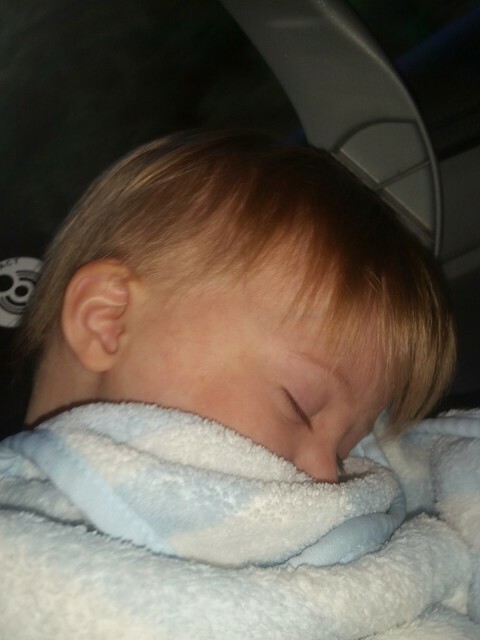 I made sure there were extra napkins in the glovebox, a roll of paper towels under the passenger seat, a full container of wet wipes in the passenger door, a full box of kleenex, a bottle of hand sanitizer, extra lip balms and hair ties, extra shopping bags for trash, and a diapering kit within easy reach. I tied a shopping bag for trash near each of the three older kids so we didn't end up with a car full of garbage. I also attached Liam's cup to his seat with a cup strap so I didn't have to constantly reach back to find it! 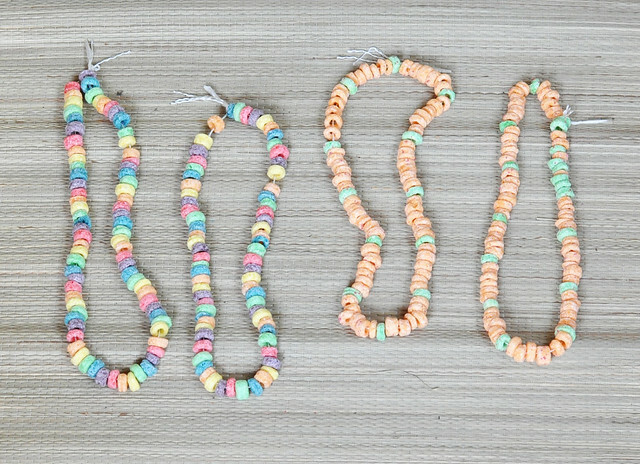 I refilled the stash of lollipops and cereal necklaces in the storage compartment between the front seats to use in case of emergency (AKA meltdowns). Of course, we had the DVD player, game systems, tablets, and iPods. But I wanted other things. Somehow those things always become "boring" on road trips! My big project before we left was putting together a travel bag for each child! 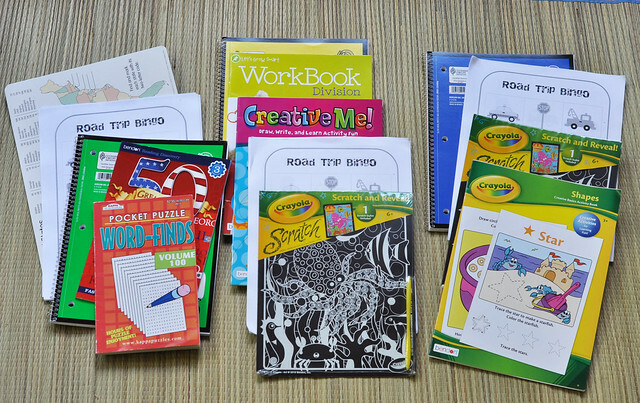 I picked 4 bags up from the Target Dollar Spot and filled them with activity kits and new goodies to keep them busy during the long drive. They stayed in the front seat, at my feet, and I passed back new items every hour. The kids loved discovering what was in their bags! Once we got to the beach, everything was put back into the bags and they stayed in the car until we left. On the way home, they kept the bags near them and played with whatever they wanted. 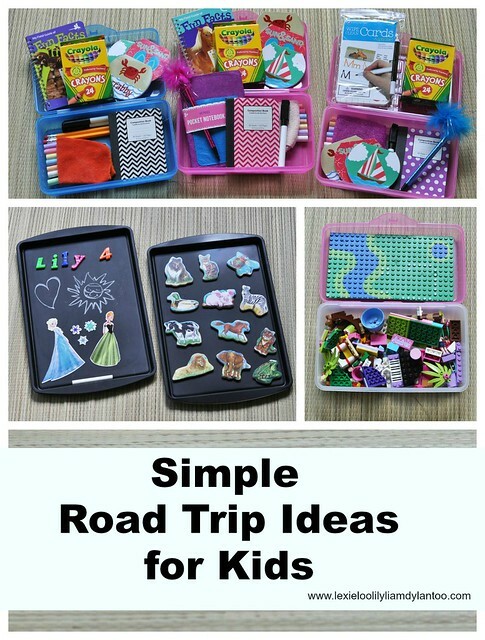 I completed a few simple and inexpensive DIY projects for the Road Trip Activity Bags before vacation. When I say simple, I really do mean simple! 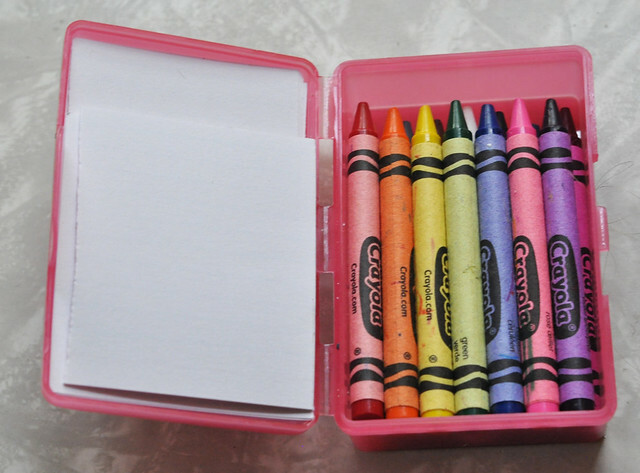 -Cut a Lego board to fit in the lid of a 50 cent pencil box. This is much easier than it sounds and can be done using a pair of scissors. I didn't even measure! I just eyeballed it, cut, and made sure it fit! 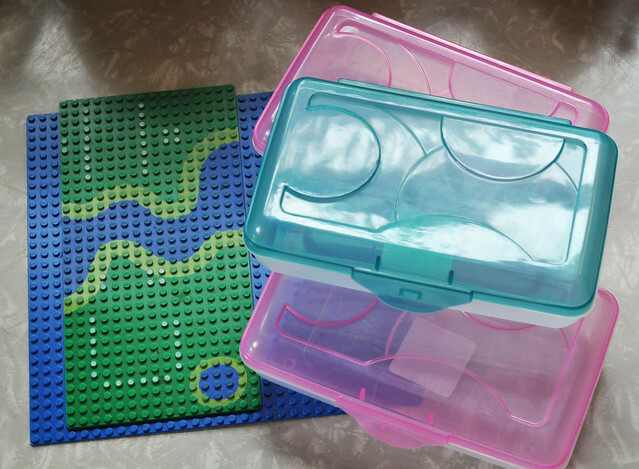 -Glue the Lego board to the inside of the lid. 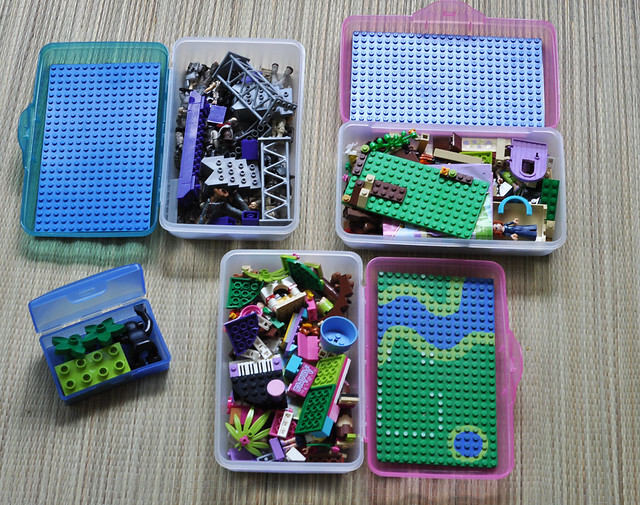 -Once dry, fill the pencil box with Lego pieces. 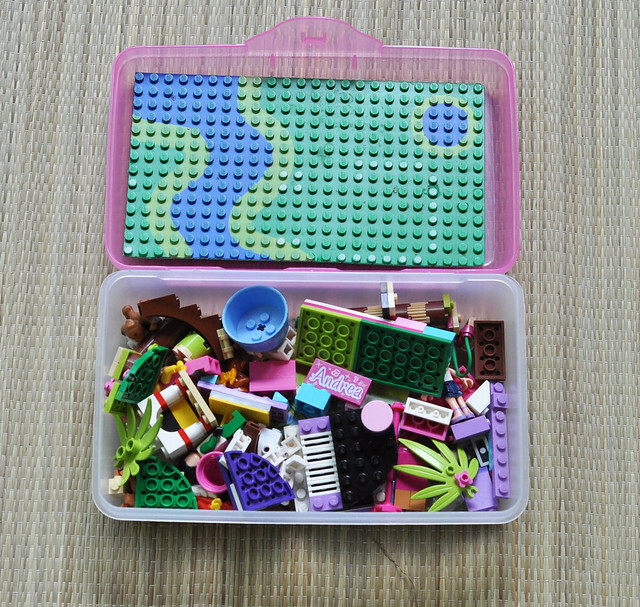 For Liam's kit, I just used a travel soap box that was under $1 and filled it with Lego Duplo pieces! 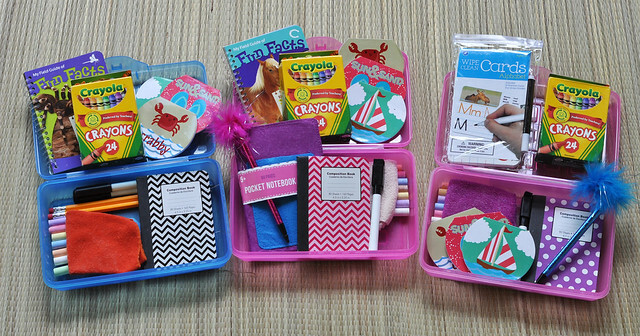 Easy on-the-go building fun, easy cleanup, and easy storage! This is another easy, inexpensive idea! -Cut index cards in half. 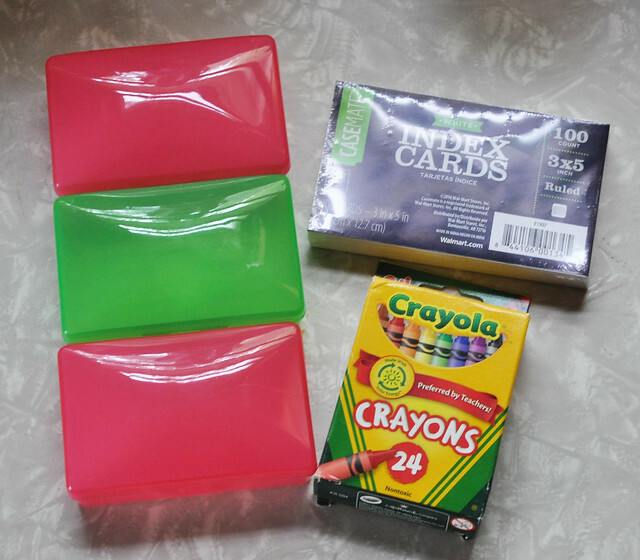 -Open a travel soap box and put the index cards in one side and fill the other side with crayons. The crayons fit so perfectly that I swear the soapbox was meant to hold them! I didn't make one for Liam because I knew he would just rip up the paper and chew on the crayons. I did, however, make an extra one to keep in my purse for outings! I love this idea! It can be completed using a 99 cent cookie sheet from Walmart and a can of Chalkboard spray paint. It literally only took 2 minutes to paint the cookie sheets, and the project was done! -Paint cookie sheets and dry overnight. 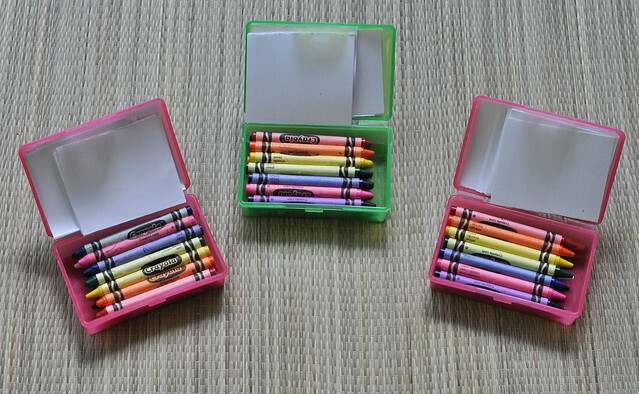 -Collect magnets and chalk and put them in a zipper binder pouch. 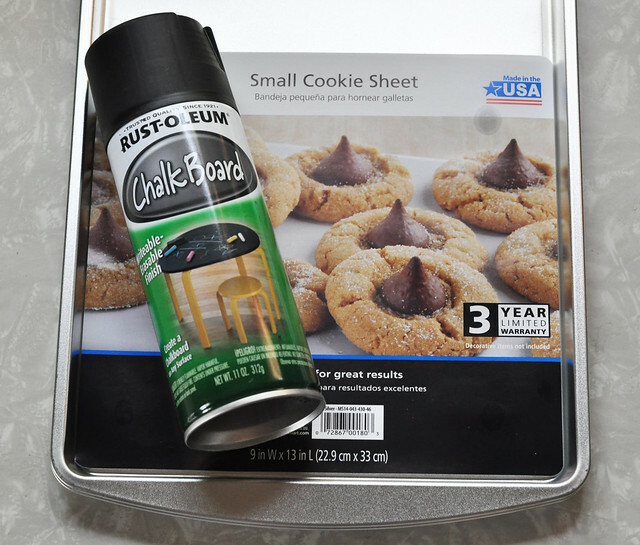 -Stack the cookie sheets together for storage and attach the pouch to the cookie sheets using a large magnet (can be found at hardware stores). 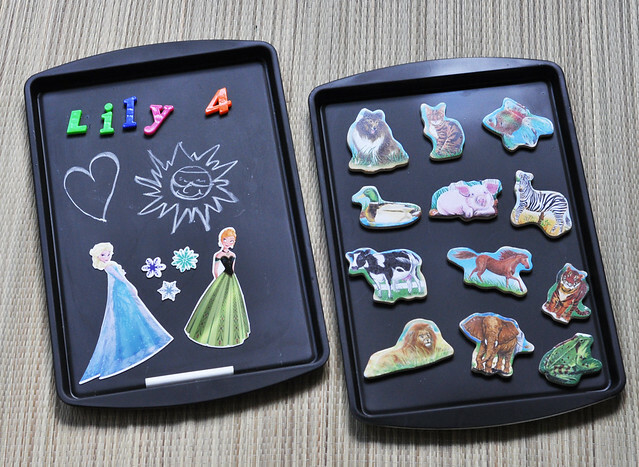 Kids can also use the cookie sheet for coloring and to hold their food. 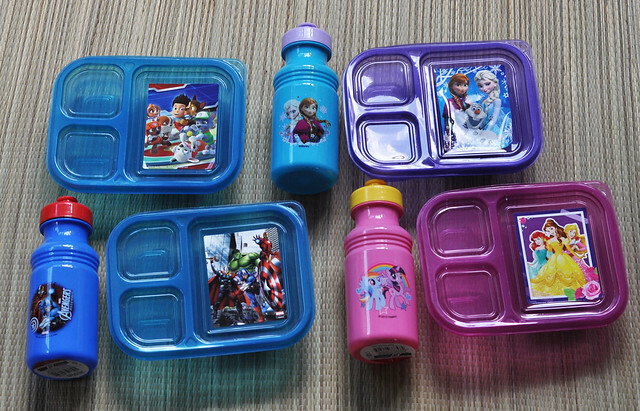 Another fun idea is to draw roads and parking spots on the tray and attach a small storage bag of cars! As for the rest of the items, I kept it simple! 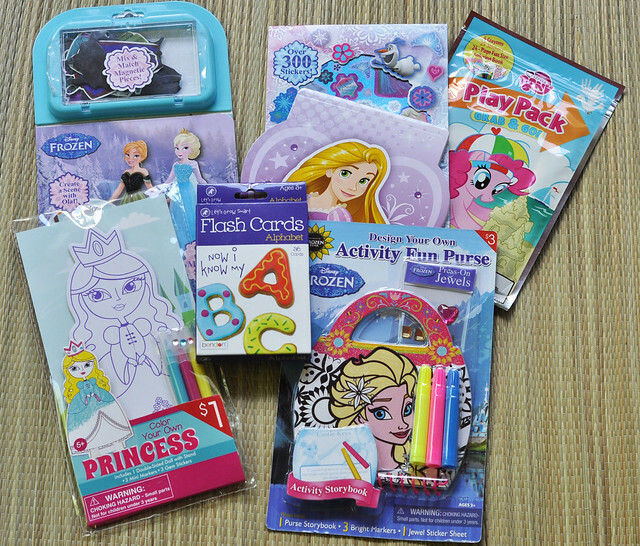 Almost every item was found in the Target Dollar Spot! Our drive to and from Virginia Beach was a success! 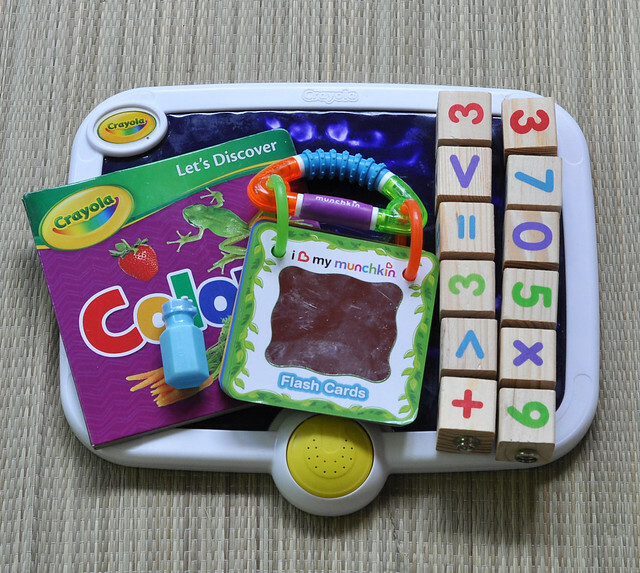 A lot of the items are now part of our On-the-Go Activity Bag that we keep in our car, or were stored away for our next road trip! What are your favorite ideas to make road trips just a bit easier? Okay, so where do I place my vote for Mom of the Year?! Man, you're amazing. I will be bookmarking this page for future road trip reference. Seriously impressive! So many great ideas... Thanks so much! Awww, thank you! Everything was so easy to put together! Seriously lady your mommy fun organizational skills are amazing. I love that you share your secrets with those of us who are less creative :). Just don't ask me to sew or draw! Haha! PS- These are very cool ideas! You always think of everything!! We've never taken a long car trip before, but when we do I'm using this exact post as my packing list, ha!! Haha! I just like to be prepared for anything! I love all of these ideas! We take a 24 hour round trip each year. 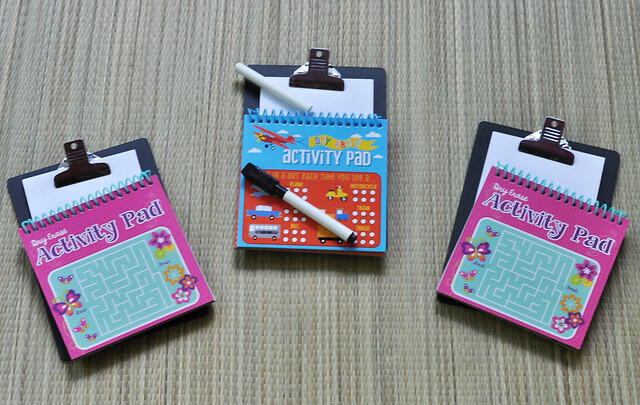 These will definitely coming in handy! !